Ever forgotten where you parked your car? If you use Google Now then that could become a thing of the past, as the service now includes a parking detector. “When the card shows up in Google Now, you’ll see an indicator showing the approximate location of your car. To see other locations where you’ve recently parked, touch Previous locations. 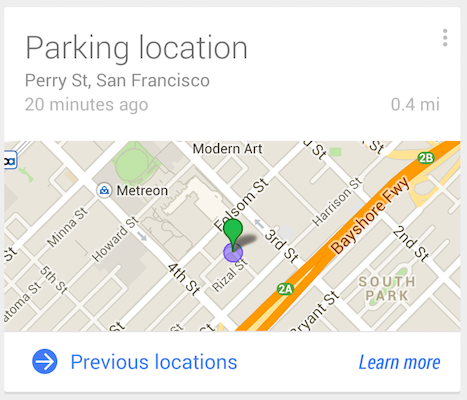 Your location data for parking location cards isn’t shared with anyone else,” Google explains. The company says Google Now uses sensors in your phone to work out when you leaving a moving vehicle. That means that you might see the card if you get out of a bus or another person’s car — cards can be dismissed on erroneous occasions, while they can also be disabled entirely. Other changes to Google Now, as noted by Android Police, include a new reminders interface, a centralized list for nicknames and the option to open some settings using voice. Sadly the update doesn’t include the ability to find your keys or retrieve your parking ticket.